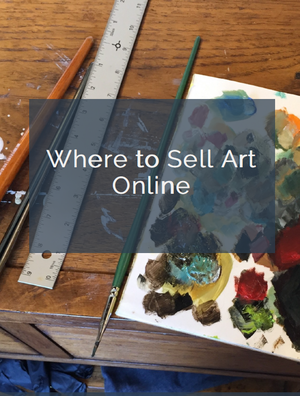 Feeling stuck, trying to market and sell your art, looking for publicity and interest? Stop thinking small. Start by thinking big, and giving yourself a promotion. Right now. I frequently speak at art business workshops and will often start out a presentation by suggesting that the artists in attendance make a commitment, then and there, to operate their businesses at a higher level. That means that you give yourself a promotion to become CEO of your small business. It means that you pledge to have professional standards for yourself and the way you market, sell and interact with customers, which reflects the serious way you view your art and your goals. You work hard in the studio to create your art. It deserves to be presented in the best possible way, through excellent images, without compromises or making excuses. Your art website should be impressive, function smoothly, and include compelling content that draws the visitor in. It represents you as an artist. Make it count. In my estimation, about 80% of artists are “in the pack” and struggling to break out. They want to get exposure, find some traction, and are elbowing their way into getting a little space to stake a claim. But many times those artists are willing to accept lower standards, or only making half the attempt they know they should. Sometimes, it’s because they aren’t sure what they want, or don’t know how to proceed. That’s where defining your vision, and setting goals really matter, because they keep you on track with a single purpose, and without distraction. One of the ways you can reach the next level in your business is to behave as though you are already there. If you’ve got gorgeous “money shots” of your work that would look perfect in a magazine, guess what? I’d say you are ready to reach out to those publications and get that photo into one or more of them. When you are ready for what’s next, you can take advantage of opportunities that arise without scrambling to figure out how you are going to finish your body of work, or find a professional photographer, or put together an artist statement. Coming from a place of professionalism in all things translates into how your work is viewed, and how seriously you are taken. That also makes your work more appealing to a customer. Would you want to buy from someone who presents like an amateur? And doesn’t seem ready to do business? Of course not. Step back and take a look at your current situation (or get input from others, especially people who don’t know you and will give you their honest opinion.) Is your body of work ready to sell? Is your presentation right on target, whether it is an exhibitor booth, a marketing brochure, an art website or other vehicle? If you are doing it right, I congratulate you, because it’s a lot of hard work and as you know, it shows. But if you need to give yourself that promotion, do it now. There is no downside to being a professional. The upside is not only the results you will get, but how it will make you feel. Like a CEO. That’s great advice…think like a CEO of your company…I like that! !